Across the pond from London's Underground train system comes a poster that reminded the public of seasonal events, such as the winter or summer sales. 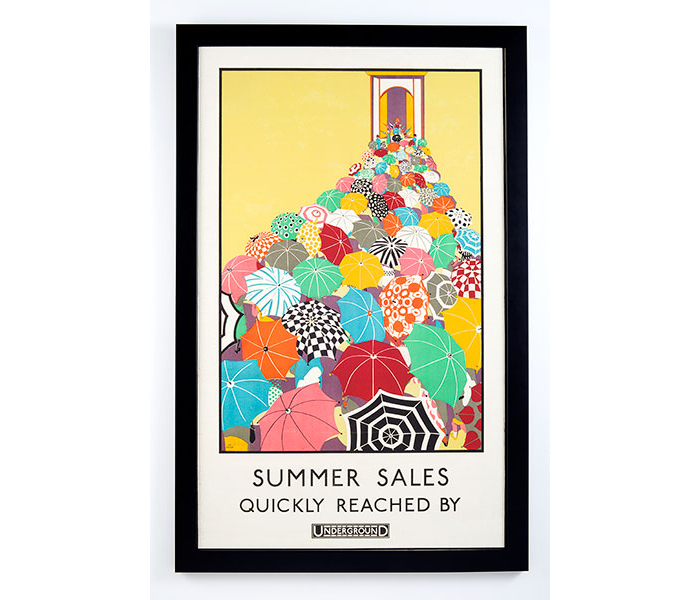 This reproduction of the Summer Sales Quickly Reached by Underground vintage poster by Mary Koop Graydon shows an eclectic group of graphic umbrellas, a nod to the bold geometric style of the time. Some also consider the umbrella a metaphor for the shelter of the Underground. The original poster was commissioned by the Underground Electric Railways Company of London to promote travel to the summer sales of 1925. It was the only poster Koop designed for the Underground Group.